Republican Senator Jeff Sessions of Alabama, who has been chosen by Donald Trump to be the next attorney general in the U.S., vehemently disputed what he called amazing allegations that he holds racial bias and claimed he understands struggles that LGBT Americans go through. However, Sessions told the Judiciary Committee of the Senate, which is holding his confirmation hearings for leading the Justice Department that he was critical of the H-1B visa program and he implied that religion could play a role, albeit indirect, in whether a person was accepted into the United States. He appeared unfazed by the protestors, and many inside the hearing room cheered when those protesting were removed. Several times during the day, other protesters interrupted his testimony. At least two people who shouted also interrupted his opening comments. 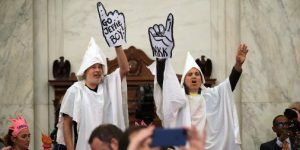 In an indirect message to the protesters, Session told the committee that he abhors the Klan, its hateful ideology and what it represents. In the statement to the members of the committee, Sessions spoke of the polarizing issue related to policing communities that are minority populated. He defended law enforcement saying it has been unfairly maligned and insisted he understood the struggles of African Americans. He faced many tough questions related to his civil rights record and his plan to cool tensions between officers of the law and communities that they serve. Sessions, who is 70, has been fiercely criticized by top Democrats as well as some civil rights organizations over allegations that have been around decades that he used racist remarks during his time being a U.S. attorney in Alabama. On Tuesday, he dismissed those allegations as false or having been taken out of context. Charles Grassley, a Republican senator from Iowa and the chairman of the committee said that the 20 years Sessions had in the senate mean the members know him well. Senator Al Franken a Democrat from Minnesota pressed Sessions over if he has inflated or misrepresented his role in the prosecuting of cases involving civil rights and standing up for minorities during his time as U.S. attorney. Franken in particular discussed the claim by Sessions that he had personally handled a number of cases, suggesting his involvement in the cases might have consisted of only signing documents.